In October took place the 11th edition of the Hungarian Budapest Music Expo at the HungExpo Exhibition Centre. This year around 10.000 people were attending the 3-days long show. One more year, audio company BG Event Kft., official distributor of RAM Audio products in that territory, participated in the trade show, showing to visitors all their represented brands. 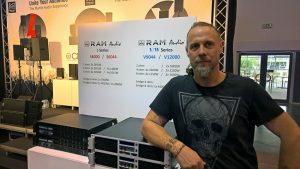 Complete range of RAM Audio amplifiers were displayed at BG Event stand, where, as per words of the managing director, Mr. Balázs Szentiványi, a considerable number of attendees were interested in the Spanish amps. One of the customers of BG Event who acquired some RAM Audio V amps at the show.